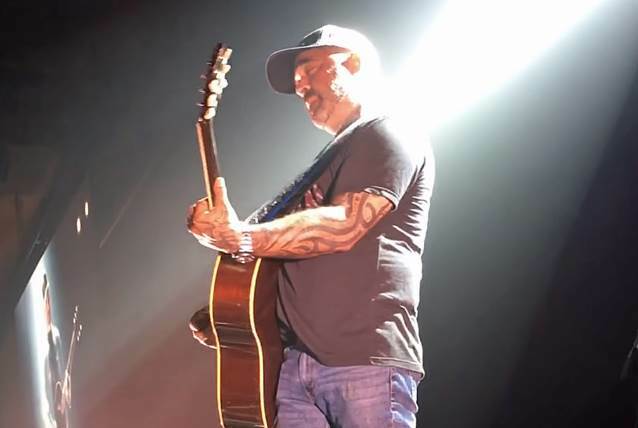 Aaron Lewis held a moment of silence in honor of Vinnie Paul Abbott during his June 23 concert at at Golden Nugget in Lake Charles, Louisiana. The STAIND frontman then moved the microphone to the back and performed a very raw, acoustic version the band's song "Intro" as a tribute to the former PANTERA drummer, who died one day earlier in Las Vegas, Nevada. In a 2011 interview with the Dallas Observer, Lewis said that he was greatly affected by the 2004 death of PANTERA guitarist — and Vinnie's brother — "Dimebag" Darrell Abbott. "He is a dear friend who is no longer with us," he said. "Every show that I can ever remember playing in Dallas, Vinnie and Darrell were there. I have found it strange playing in Dallas and feeling like someone was missing." Vinnie Paul passed away on Friday (June 22) at the age of 54. The former PANTERA drummer apparently died in his sleep at his home in Las Vegas. No cause of death was given at press time, but sources close to the drummer told the Las Vegas Review-Journal that he suffered a "major heart attack." Vinnie's body had been turned over to the medical examiner to determine an official cause of death, after which his body will be flown to Texas to be buried between his mother and brother.